Bing published some upgrades they made to Bing search the other day. In short, they upgraded their intelligent answers system, their text-to-speech capabilities and their visual search engine. Bing said they can now provide more "comprehensive, summarized information aggregated across several sources in response to certain queries." Bing said by new computing power and technologies they are able to "provide answers for harder questions than ever before." 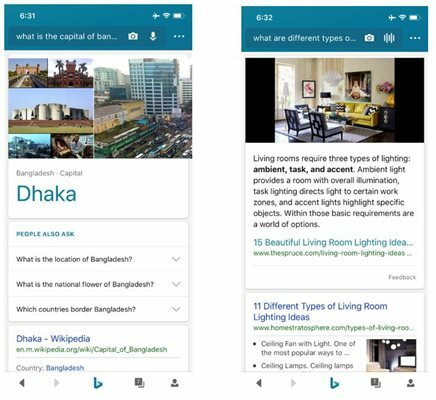 Here is the example they gave, instead of the relatively simple answer to ‘what is the capital of Bangladesh’, Bing can now provide answers to more complex questions, such as ‘what are different types of lighting for a living room’, quicker than before. The new Bing app can now change text to speech. In short, Bing can speak answers to your queries back to you "with a voice that’s nearly indistinguishable from a human’s," Bing said. Again, Bing gives credit to NVIDIA GPUs processing power to make this possible. Bing added the ability to search using an image, although I though Bing had that before. Bing's example, if you see an image of an accent light you like, Bing can show visually-similar decor and even show purchase options at different price points if the item is available online. To save you time, visual search also automatically detects and places clickable hotspots over important objects you may want to search for next. Forum discussion at Twitter.